I ate grilled chicken breast meat with grated white radish and ponzu source, and rice, miso soup, and shinodani. Combination of ponzu source and chicken breast meat and grated white radish is great. Grated white radish makes fluffy texture. 1 tbsp of ponzu source make lite flavor, I recommend 2 tbsp. And prepare the following utensils. Most of water in white radish will be discarded. There are some way to use it, but I didn’t use it this time. Drain grated white radish. Prepare coffee dripper, filter and mag cup, and put the grated radish into it. If you don’t have dripper, squeeze it lightly. Chop thin green spring onion shoots into 3 mm pieces. Chop chicken breast meat into easy-to-eat sizes. On the chopping board, put cooking sake, salt and pepper on the chicken, and rub them well. 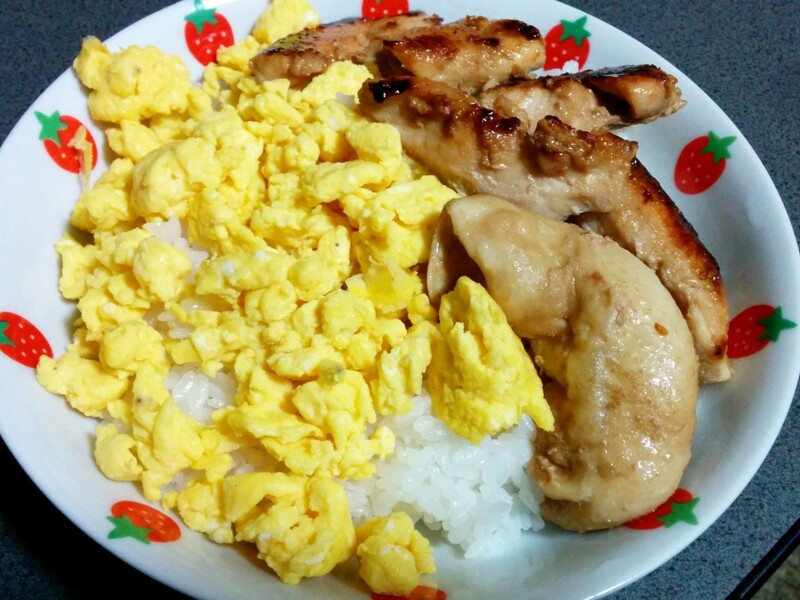 Put salad oil into frying pan, and grill chicken breast meat. Brown both side of the chicken, and stop the fire. 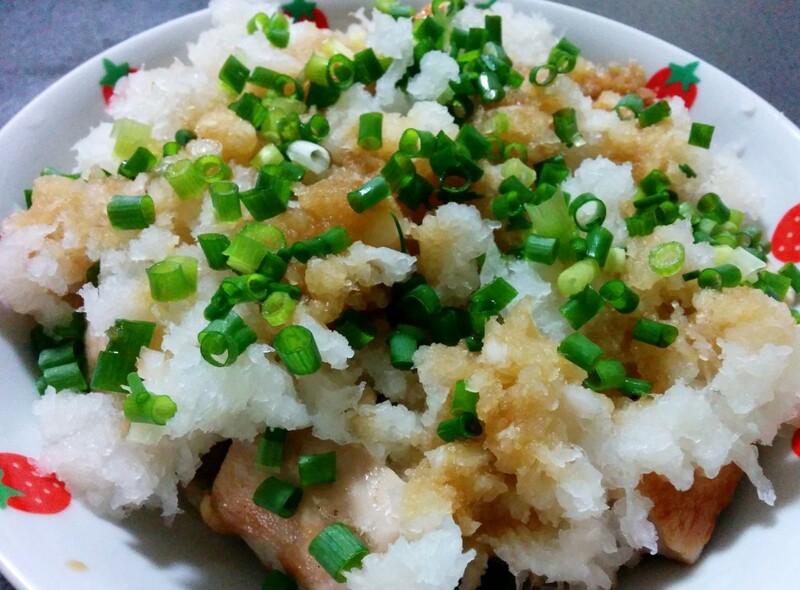 Put the chicken onto dishes, put grated white radish and thin green spring onion over it. Lastly, put ponzu source on. I had rice porridge at breakfast. The tip to make good rice porridge is using cold rice. I put rice into refrigerator when rice was remained. 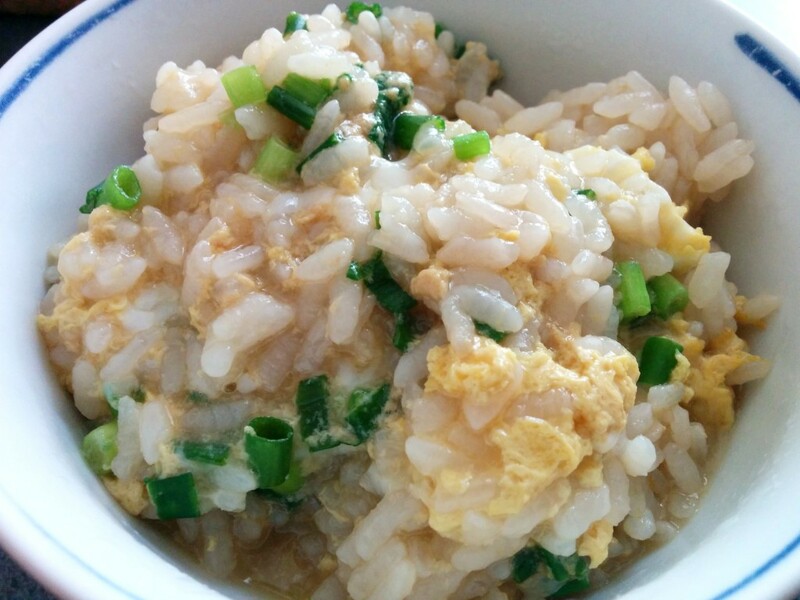 And at the day when much rice was in the refrigerator, I use it for making rice porridge. It is good to make fried rice, but it splits oil. Prepare the following cooking tools. Chop green onion into 5 mm pieces. Put water, soy source, cooking sake and hon dashi into pot and make it on fire. After boiling, put rice into the pot. When you think the rice absorbed water, then put beaten egg and chopped green onion into the pot. When the egg become boiled, the finish. 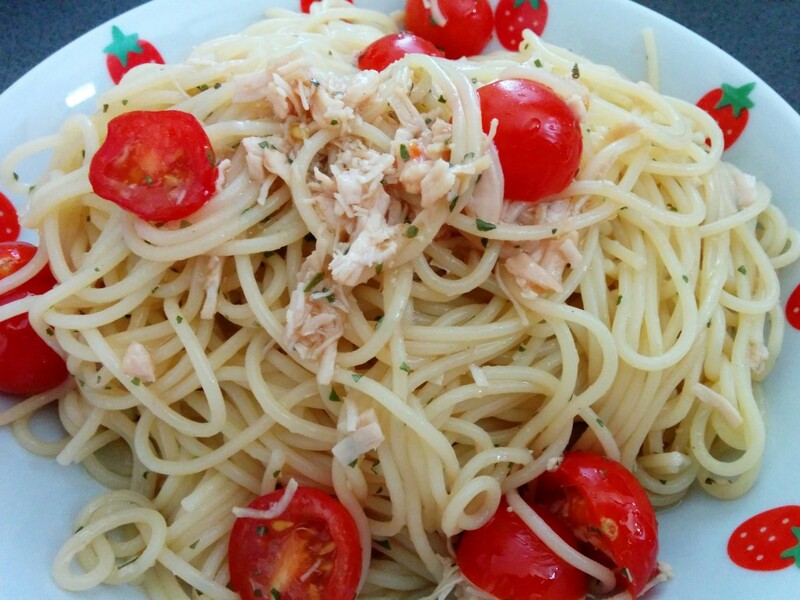 I ate cold pasta with mini tomato and canned tuna. It is very easy cooking. I recommend you to buy some amount of pasta. And I think Garcia olive oil has good flavor. Cheap olive oil is something like water. Prepare the following kitchen tools. Chop mini tomato to half. Open canned tuna and drain it. Put all ingredients except pasta (mini-tomato, noodle soup, olive oil, garlic tube, salt and pepper, basil and canned tuna) into the bowl and mix well. After boiling pasta, drain it and ice it with cold water. Drain the pasta again, and put it into the bowl. I ate special class, called “Tokkyu”, of handmade vermicellifine noodles “Ibo no Ito”. It was very good! This is a famous product of Hyogo prefecture in Japan. It is severely managed product. It’s good to add some fruit. The following cookware is required. The cooking instruction is written on the package of Ibonoito, so it is good to see it. Drip water into the pot and put it over fire. Once the pot boils, put noodles into the pot and wait 2 or 3 minutes. 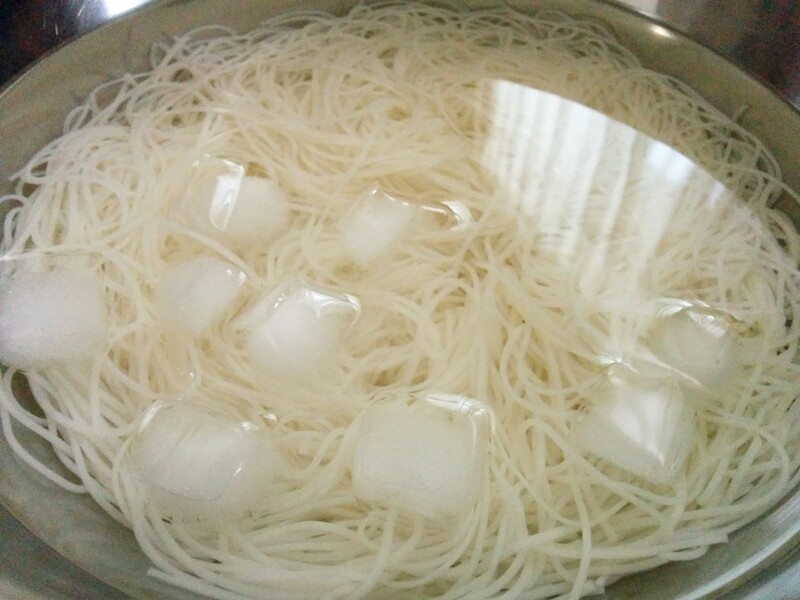 Now, put boiled noodles in water, and make it cold. 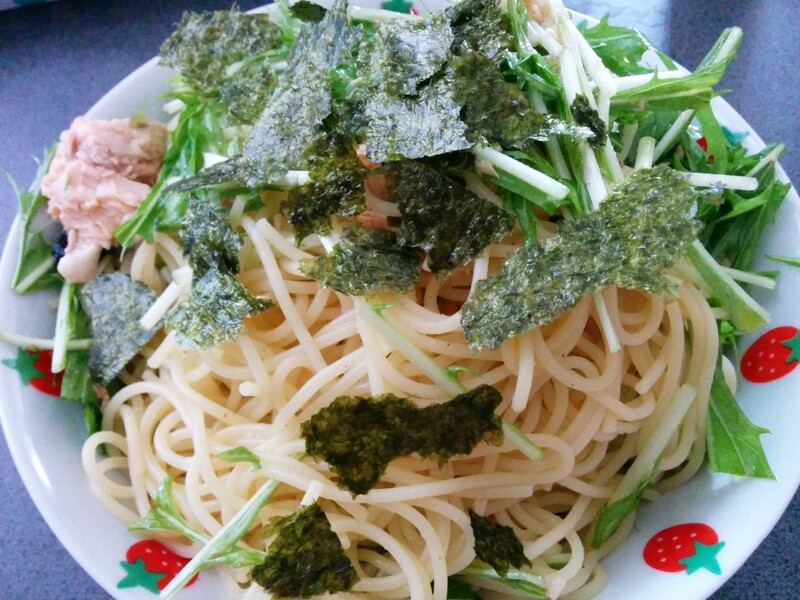 Put cold noodles into some plate. Prepare noodle soup and chop leeks, put leaks into noodle soup. Now, get some noodle and put it into noodle soup, and bring the noodle into your mouth. I ate saury kabayaki on DoYo Ushi day. What is “Doyo Ushi Day”? “Doyo” is the specific days that last for 18 days before the first day of season, spring, summer, autumn and winter. “Ushi” is Ox, and the day of the Ox is a calendar day of the Chinese Zodiac. In Japan, people eat eel to get energy during the hot summer months, often in kabayaki dish, which is something broiled. But eel is too expensive so I bought saury kabayaki. 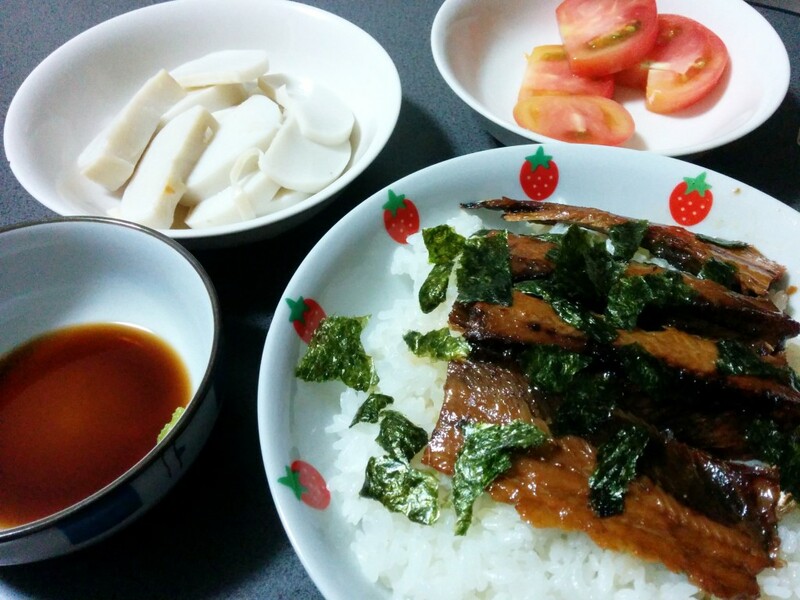 There was a saury kabayaki in my house, then I made lunch with it. The kind of saury kabayaki used this time is “Toro Saury Kabayaki”, made by Tsukudani street in Aichi Prefecture, Japan. Tsukudani street runs restaurant. Tsukudani street sales tsukudani, food boiled down in soy, since 1949. Heat saury kabayaki, according to the way written on package of it. Put saury kabayaki on the rice. 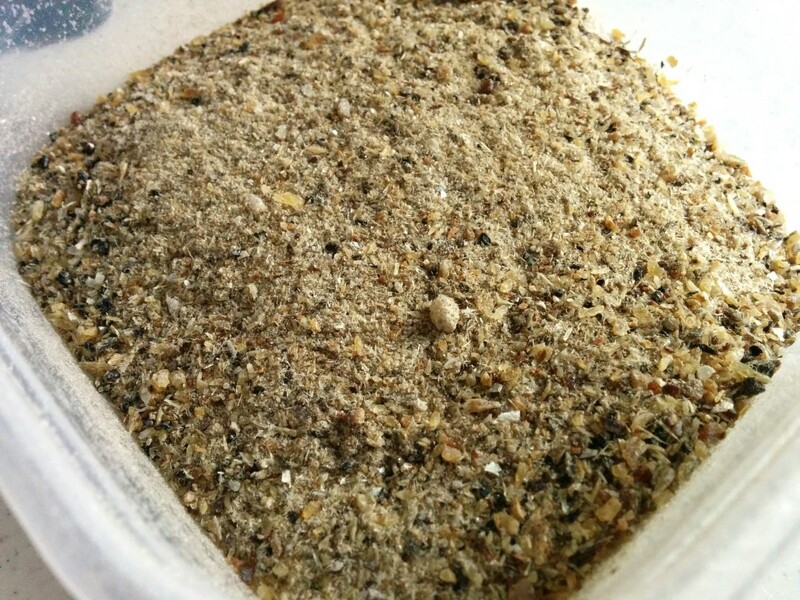 Tear baked laver and sprinkle it on the dish. Slice tomato and boiled fish paste into about a half of inch. Prepare soy sauce and wasabi for sliced boiled fish paste.